Display for Coney Island Boardwalk Custard Does Not Pass Muster - Gottlieb, Rackman & Reisman, P.C. To register a trademark with the U.S. Patent and Trademark Office (“USPTO”), a trademark owner must use the mark in “interstate commerce.” As evidence that the mark is in use, the applicant must submit a sample of the mark–called a “specimen of use”–showing the mark as it is actually used in commerce in connection with at least one item in each class of goods or services. Acceptable specimens for trademarks include packaging, labels, or tags for the goods, or a display associated with the goods. Regardless of the type of specimen, in each case, the trademark owner’s evidence of use of its mark must demonstrate that the relevant consumer will make an association between the mark and the relevant goods in the context of the sale of the goods. In the recent precedential case, In re Kohr Brothers, Inc., Serial No. 85430114 (TTAB 2017), the Trademark Trial and Appeal Board (“TTAB”) affirmed the Examiner’s refusal to register the mark CONEY ISLAND BOARDWALK CUSTARD [CONEY ISLAND and CUSTARD are disclaimed apart from the mark] for use on “frozen desserts, namely, frozen custards” due to applicant’s failure to submit an acceptable specimen of use. 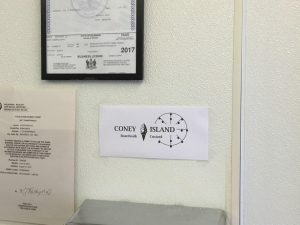 Applicant owns an issued registration for the same mark CONEY ISLAND BOARDWALK CUSTARD covering “retail stores featuring frozen desserts and beverages,” namely, Registration No. 4939484. (B) the goods are sold or transported in commerce. As Section 45 of the Trademark Act does not specifically define the term ‘displays associated therewith,” the TTAB must make a case-by-case determination of whether a particular use asserted to be a display is sufficient to demonstrate use in commerce. Typically, displays associated with the goods essentially comprise point-of-sale material such as banners, shelf-talkers, window displays, menus and similar devices. The display must prominently display the mark in question and associate it with or relate it to, the goods. In other words, the display must be associated directly with the goods offered for sale. In the present instance, the specimen is a piece of paper taped to a wall at the custard stand with the words CONEY ISLAND BOARDWALK CUSTARD and a stylized image of an ice cream cone printed on it. The location of the sign on the wall appears to be above the top of a garbage can. Along with applicant’s sign on the wall were applicant’s business permit and a food establishment permit. Based on the placement of this evidence, the Board found that the taped sign would support use in connection with restaurant services but not trademark usage on custard. Interestingly, the USPTO accepted the identical specimen in support of applicant’s use of CONEY ISLAND BOARDWALK CUSTARD in support of its use in commerce of the mark in its registration covering “retail stores featuring frozen desserts and beverages” referenced above. Applicant argued that even though the actual custard is not visible to customers as they pass by the stand, the point-of-sale display of the trademark is nevertheless associated with the goods in that the sign has a picture of the goods offered for sale; a picture of the frozen custard in a cone on the sign and that the frozen custard goods are in close proximity to the sign as displayed on the wall. Moreover, applicant stated that the mark CONEY ISLAND BOARDWALK CUSTARD may not be practically placed on the goods; and that the sign is in a conspicuous location at eye level for public view. On applicant’s appeal, the TTAB found that the mark on the sign is not displayed at the point of purchase in such a way that the customer can easily and directly associate the mark with applicant’s custard. Notwithstanding applicant’s allegation that the sign was a point of sale display, the sign was not shown to be in sufficiently close proximity to the sale of the custard. Additionally, the small size of the sign taped on a wall would not be likely to catch the eye of the consumer. Finally, applicant’s stylization of a cone on the sign did not contain any information about the custard: no information as to portion sizes, flavors, cost or the like was available on the sign. Rather, the depiction of a cone on the sign is more likely to be perceived as part of the overall trademark design rather than an indication of the nature of applicant’s frozen custard. Accordingly, the TTAB refused registration of the application on the grounds that the display is not associated with the sale of the goods and cannot serve to support the required showing of use in interstate commerce. In cases where it is impractical to place the mark directly on the goods or packaging for the goods, it is important to use the mark on a point-of-sale display in such a way that the displays serves as more than mere advertising. It may not be enough that the display appears at the point of purchase; the display must provide sufficient information for ordering the goods and serve as an inducement for ordering the goods. Menus and billboards still serve as good specimens in situations where the mark cannot be used on the goods. When you are not sure whether a display or other specimen will be sufficient to satisfy the use in commerce requirement, it is strongly encouraged to seek advice of IP counsel in avoiding this common pitfall.